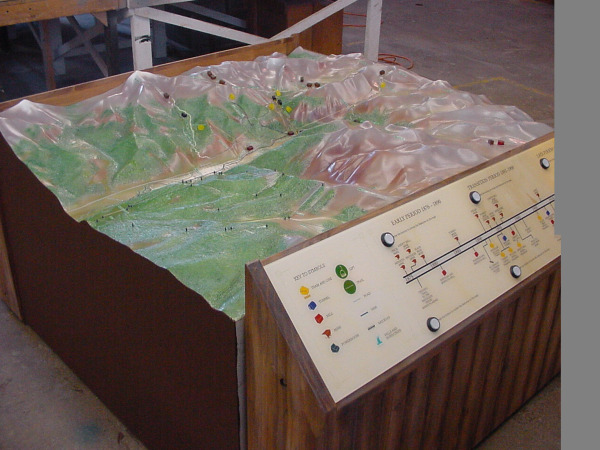 This topographic model in the Telluride, Colorado airport draws visitors to historic attractions they may not otherwise visit, including the history museum where it previously was located. Viewers can interact with this popular exhibit to see all the area attractions that may interest them - historic, recreational, or geographic. This touchable fiberglass model is 48" X 50" with 6.5" of relief. The model scale is 1:9000. Buttons light up icons for trams (yellow), mines (gold), tunnels (blue), the power house (gray), the mills (red) and other features from different time periods in Telluride's history. A popular walking trail is also shown that goes well up into the mountains and circles back into town. Labels on the model clarify what each attraction is such as Mendota Peak, Coronet Creek, the Origin Trail, Funicular Cable Railroad, Sheridan Vein, etc. 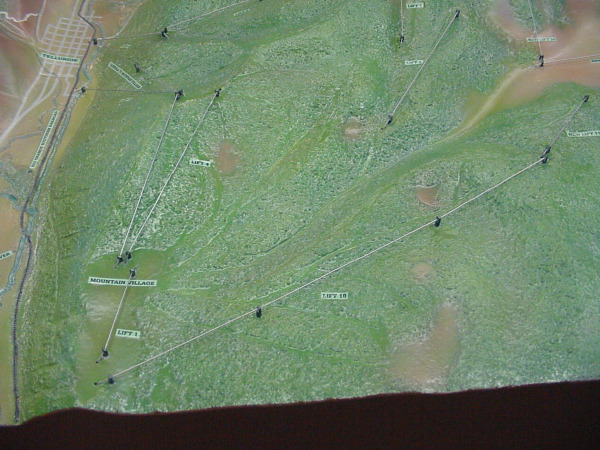 The model also highlights the ski lifts, which are shown using piano wire mounted on metal posts. On the lower left is the Boomerang trail that goes from the ski area back down to the town. This model makes it easy to visualize the ski trail slopes in three dimensions which is far more engaging and useful than a flat ski trail map. It helps skiers decide which trails they may want to ski. The elevation change shown is from 8,660' to 13,580'. 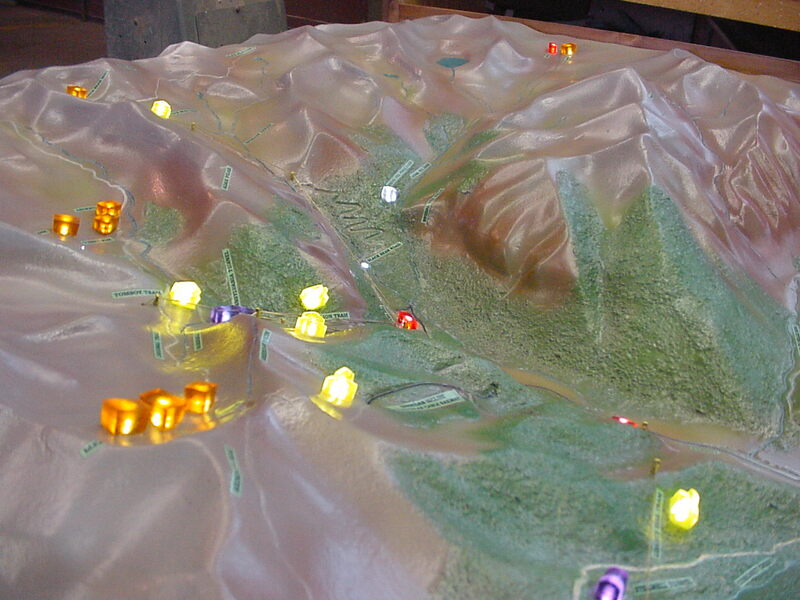 Topographic models are highly effective ways to quickly orient and inform visitors to any area, especially a large area like Telluride with many winter and year-round attractions. They make visitors more comfortable and engaged in their new surroundings, and they bring enthusiastic people to each attraction. Model Builders, Inc. is known for creative, economical, realistic topographic models. Take the next step by contacting us at Model Builders, Inc., 773-586-6500 or info@modelbuilders.net . Museum interactive exhibits engage visitors if you make it clear what the exhibit is all about and make it easy to use. 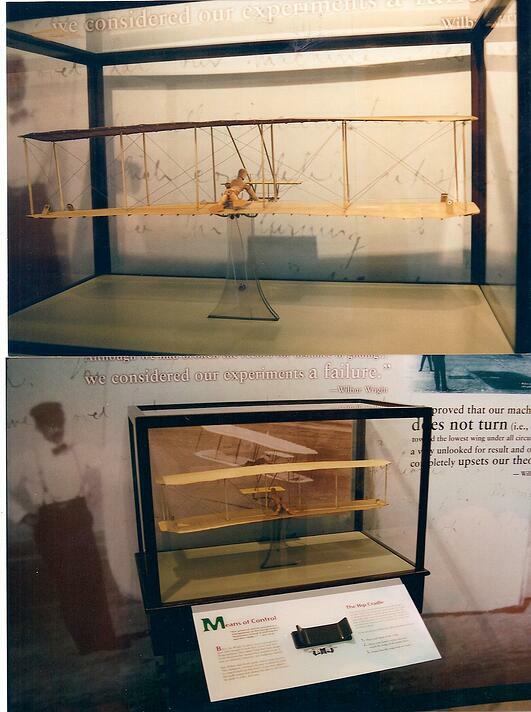 The Wright Dunbar Interpretive Center in Dayton, Ohio has a museum interactive that shows how the Wright Brother's wing warping concept controls the wings on a biplane enabling it to turn. When the visitor moves a U shaped control the pilot in the model biplane moves his hips to the right or the left. The hip crade moves wires connected to it which causes one end of the wings to twist in one direction and the other end of the wings to twist in the opposite direction. This enables the pilot to bank and turn. How do you focus museum visitors on the point that the Wright Brothers knew from racing bicycles on a banked oval wood track that flying in the air in three directions would be very difficult to control? 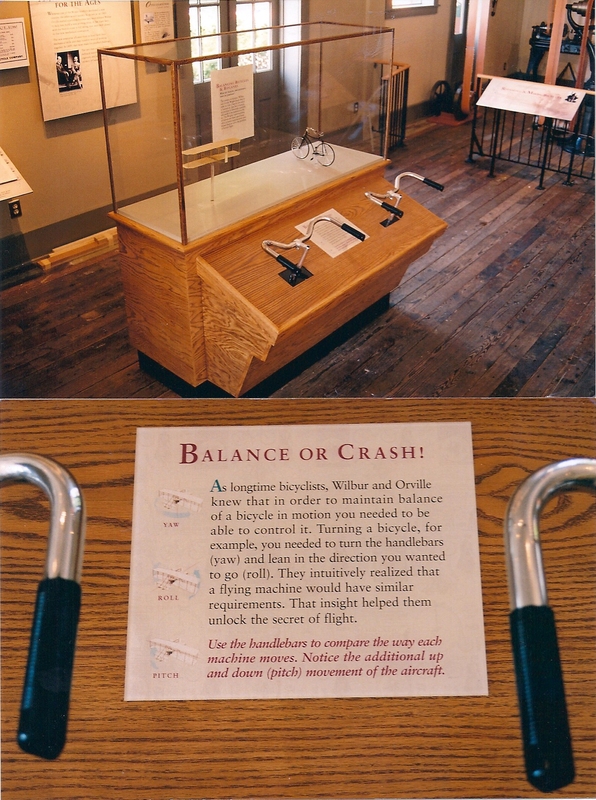 The following exhibit with one handlebar used to control a 12" long bicycle in only two directions and another handlebar used to control a 12" wide glider in three directions lets the visitor experience how much more difficult it is to control a glider in three directions than a bicycle in two directions. Museum interactive exhibits need to be user friendly to work best. Exhibit designer Jeff Kennedy wrote an excellent 77 page book called "User Friendly Hands-On Exhibits That Work" which is available from the Association of Science and Technology Centers (ASTC). Look in the Exhibits section of the ASTC publications at http://astc.org/pubs/browse_publications.htm#exhibits . If you would like information on having a museum interactive exhibit fabricated contact us at Model Builders, Inc. 773-586-6500 or info@modelbuilders.net . Let us know below in the comments what your favorite museum interactive exhibit is and what museum it is located in.